I actually do my best thinking when I am asleep! I have a very difficult time shutting off my mind. So most times whatever is going on in my life works its way into my dreams. I often wake up in the middle of the night and have to reach for a scrap of paper by my bed because I either figured out a problem I was having at work or had a great idea for a book / blog post. This can be a great thing, but sometimes it backfires. I recently made a new “rule” for myself that I can’t check my office emails before bed. The last dream that I remember was a couple of nights ago. In it I was making tee-shirts, with this elaborate technology involving photos. But not digital photos, the old fashioned kind (which makes you doubt this elaborate technology). The funny thing is when I was in my early teens I used to paint tee-shirts and sell them door to door. Maybe my mind was telling me to go back to basics? About eighteen years ago I decided I wanted to write a book. The Soprano’s were big at the time and I wrote about 80 pages of a Mafia story but I never finished it. Although I didn’t write again, I still always dreamt of writing a book. Then in February of 2010 I decided to stop dreaming and start acting. I started my blog, Feeling Beachie, as a form of practice. I wanted to see if I had the wherewithal to actually stick to writing, as well as to see if anyone would be interested in what I had to say. I fell in love with blogging and writing. Then in October of 2011 I started writing Dangled Carat. I finished my first draft May of 2012. I worked with an amazing editor, Christina Baker Kline, and completed the book the beginning of 2013. (I lost a bunch of months in the process due to the destruction caused by Hurricane Sandy) Dangled Carat was published September 2013. I think that ‘chick lit’ is the perfect escape from reality. The stories are usually light hearted and funny. The main characters are easy to relate to and fall in love with. And fashion usually plays a role. To me, it doesn’t get any better. I actually am a very eclectic reader. I read all types of books including suspense and thrillers. 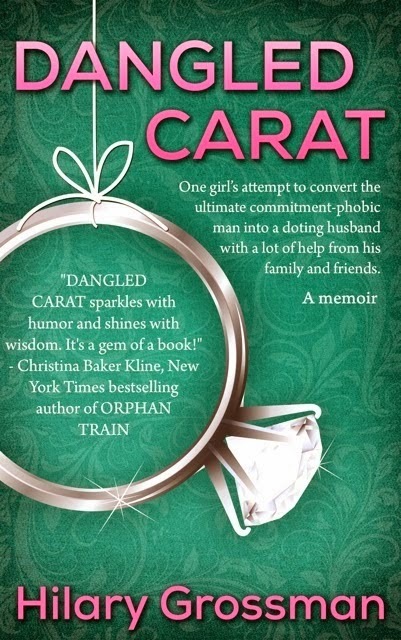 Dangled Carat, while it reads like chick lit, is actually a true story about my attempt to convert the “ultimate commitment-phobic” man into a doting husband with a lot of help from his family and friends. It is a funny but tender and emotional coming of age story, which will make you laugh, cry and want to alternately punch or hug my commitment-phobic boyfriend. While many of the things that happened to me (two faux engagement parties, for example) were very unique being involved in a relationship with a commitment-phobe is a very common situation. I felt that my story was something that so many women could relate to. But more than that, I wanted to share my story in the hopes that I could help someone else who was in the same situation. It is a very difficult position to be in. Everyone in your life has an opinion and “advice”. You always seem to be second guessing yourself and your actions. My desire to help has been accomplished! I recently received an email from a self described commitment-phobic male reader who shared that after reading the book he realized some of the ways that he has sabotaged his relationships in the past. He completely related to Marc. He also told me how he learned that he has to go at his own pace regardless of what the other person seems to want - it will either work or not. He also learned that he has to communicate his feelings and just relax - enjoy the moment and let nature take it’s course - rather than worry about what tomorrow will bring. This new attitude has kept him in a relationship that he would have already ended in the past! Yes! I work in a company that has about a hundred employees. Many of which bought Dangled Carat, so I have been fortunate to see people reading it on their lunch breaks. It was a major thrill! Glendon Haddix of Streetlight Graphics designed my cover, but I was very instrumental in the concept. In my head, I always pictured Sandra Bullock playing me and George Clooney playing Marc. Devil Wears Prada... I love that book and I love that movie. Fun fact - right before Hurricane Sandy struck, and completely turned my world around, I was watching this movie at the family member’s house I evacuated to. Out to Lunch by Stacey Ballis and Twisted Sister by Jen Lancaster. Jennifer Coburn - I just discovered her books and I love them! I wrote all of Dangled Carat on my laptop at my dining room table. Shopaholic or shopadon't? Shopaholic! Although I am sort of in recovery (I have over 50 pairs of jeans). Let’s not discuss shoes, OK? Sky high heels or closer to the ground? Sky high! Cry baby or tough cookie? Tough cookie! It is funny though, I let myself get crazy with silly stuff, but when there is a real issue I charge right through it.. Exotic beach or enchanted forest? Exotic beach - I am a major beach bum! 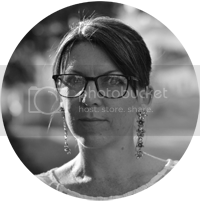 Thank you so much Suzy for welcoming me to your blog!! !